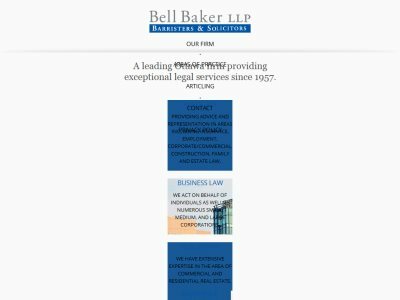 Bell Baker LLP is a law firm in Ottawa, Ontario. Providing legal services since 1957. Practice Areas: Advocacy, Business Law, Construction Law, Education Law, Employment and Labour Law, Estate and Trust Planning Administration & Litigation, Family Law, Insurance Litigation, Municipal Law, Planning & Development, Real Estate.